Good morning all! Martina here with another Imagination Craft's Rice Paper project. We used some of these at Lisa's workshop last Sunday and everyone had such fun with them! We all used different papers onto large tote and small calico bags and then chose our own rice papers to add...they were all fantastic designs and SO different from each other! This week I have used sections from two designs of Rice Paper and combined them on one card. Once I had chosen papers, I was able to pick out some colours within them to add to the rest of the card. I started the project by cutting a piece of Watercolour Card to the size I needed for a topper and then lightly shaking some Lemoncello Infusions all over. To bring some of the pink tones into the topper and take away the white areas, I used some Tattered Rose and Worn Lipstick Distress Ink with a blending tool. I started with the lightest colour all over and then used the darker colour to bring the edges in. Next, I started to add some interest and layers; using the PaperArtsy Stencil PS055 and some Salmon Starlight Paint, I added flowers over the whole area. Once the paint and paper was all dry, I started to arrange my chosen elements from the Rice Paper. I chose some clocks from 149 Design and cut them out. I didn't want them as they were on the paper, so I fiddled about until I was happy with the layout. Using some Magi-Bond Decoupage Glue, I built up some layers, stuck all the pieces down and overlapped where needed. Once the detail was all dry, I decided I wanted to add some interest and sparkle! I used a couple of shapes from the Crafter's Companion Delicate Details Foil Transfers with some Rose Gold Foil in the corners, but then decided I wanted to add even more...(steady, steady I hear you say...) To give a vintage look I added some tacky glue around the edges of the card with my fingers and let dry very slightly. I then used my left over Rose Gold Foil and pressed it into the glue areas. 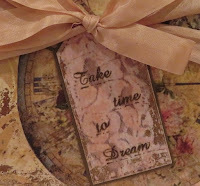 To add a message I picked a word combination from the Imagination Craft's Take Time Set. As the words are not joined together as one stamp, it is very easy to arrange them in the position that you need them to be - clever, eh? I arranged them on my block so as to fit a tag die from my stash. I then stuck a left over piece of Rice Paper Design 448 onto some card, stamped with Brown Archival Ink and die-cut. The final touches were to add some matts and layers in coordinating card and some ribbon from my stash. Difficult to see the foiling in the picture above, but it is there, I promise! That's it from me this week; happy crafting and I will see you soon!